It is Bank of America's Museums on US weekend again on December 7 and December 8 in 2013 when you can visit more than 150 arts, culture and educational institutions in the United States free with a Bank of America and Merrill Lynch debit or credit card. Postcard US-2510594 to Bulgaria reached its destination in 22 days, and it was purchased at the Nevada State Museum in Las Vegas during a previous Museums on US visit. The postcard shows Ichthyosaurs, giant marine reptiles that thrived during much of the Mesozoic era more than 200 million years ago. They evolved from a group of unidentified land reptiles that moved back to the sea, in parallel to the ancestors of modern-day dolphins and whales. 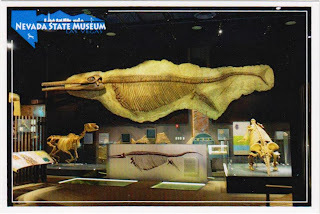 The official state fossil of Nevada is the Ichthyosaur.